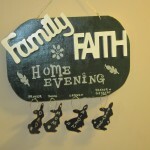 As a fundraiser for our adoption, I’m making Family Home Evening charts to sell. For those who don’t know what that is, our church asks families to set aside one night a week to hold Family Home Evening. That time is meant for families to be together to talk, have fun, read scriptures or anything that bonds families closer. So now I’m making and selling them to others. 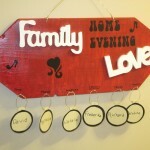 You can customize the shape, the size & colors to make it match your family’s needs. Here’s a few examples of ones I’ve done.